There's this mannequin head that's been kicking around the house for a decade now. Actually, once there was an entire garbage bag full of heads - a gift for Calvin from a hair stylist friend when he was very much into that (hair styling, not fake heads). They all saw a rather wild amount of use and abuse, though somehow over the years, we're down to just the one. She'll appear often in windows - placed there by someone to freak us out. Or in a bed with pillows to 'trick' us that someone is sleeping in their bed (only to be jumped out at from the closet - and it's ridiculous how many times this still works!). Lately, for no other reason than she has nowhere else to go, she's been sitting on the piano. And someone - I think Papa, though maybe it's Harper (likely both) - keeps changing her hat. Sometimes it'll be an orange hunting hat, or a silly hat from the dress up, or Ezra's overpriced headphones that we find on the floor (grr...). This morning she was wearing this mask, which seems rather fitting. In addition to covering up a really bad makeup job (applied with permanent markers, naturally), and a rather shoddy haircut, she's clearly festive and ready for the day. Of the four children dressing up (Calvin is with friends and on his own, though I'm guessing there will be a last minute costume addition), I know of exactly one costume plan. In the past 24 hours alone, I have heard talk of a Mermaid Queen, a clown, Pippi, a police officer, an astronaut, a "regular" mermaid, a lion, a vampire, flower fairy, a pixie, peter pan, Dorothy, an owl and surely I'm forgetting a few. In the past 24 hours! A day of making looks to be ahead! Or at least some decision-making. Thank heavens for all that dress up...and imagination to boot. Morris & Essex makes beautiful hand-printed goods, including soft, sustainable bamboo scarves, organic cotton tote bags, letterpress greeting cards, cotton tea towels, and t-shirts for babies, kids and adults. Everything is designed by artist and printmaker Eliza Jane Curtis, in a farmhouse studio in Maine, and hand-printed by Eliza with some help from a few other talented crafters and carefully chosen makers. Designs are inspired by a rich mix of sources including vintage ephemera, nature and fantasy, geometry, folk art and traditional patterns and textiles from around the world. Eliza says, "I choose to work with organic, natural and sustainable materials as much as possible. I love creating a world filled with pattern and color and fun, turning my designs into useful products that serve a need and make someone happy, and that last for years and years. I believe that the things we use everyday are important and valuable; rather than contributing to a culture of disposable goods, I aim to produce durable, meaningful, beautiful items that last beyond the first impression. I hope that the pleasure I take in designing and making is evident in the finished products." Eliza is also available for custom design projects, including gorgeous, personal wedding invitations. Follow Morris & Essex on Instagram and Facebook. I've always loved making things! My grandmother gave me my first lessons in printmaking with dried leaves, potatoes and vegetables at our kitchen table when I was a little kid growing up in the country in Maine. Years later, I was an art student in New York City when I started making hand-printed t-shirts. I took a printmaking class and completely fell in love, spending all my spare time in the printmaking studio and started making a few t-shirts for friends and family. A friend asked me if I wanted to sell them in her East Village boutique, so that was the start of my business. Over the years, it's slowly grown from a weekend hobby to a full-time job, and it's evolved as I've moved and changed. After graduating, I moved to Brooklyn, rented an old house with some friends, and built my own silkscreen shop in the basement, where I would happily print for hours after work and on the weekends. When I moved to Buenos Aires, Argentina, I found it was harder to get some of my favorite supplies there, so I started doing more work with paper, and began designing and printing greeting cards. In 2010, I moved back to Maine with my partner and we bought an old, abandoned farmhouse and started renovations. I picked a bright, sunny room above the kitchen to build my printmaking studio, and began taking small-business classes, learning how to grow my passion into a real business. Once my first daughter was born, I hired a friend to help me with a bit of my work in the studio and now that I have a second baby on the way, I'm working hard to balance a growing business and a growing family at the same time! I am so happy to have built a job that lets me work at home and spend time with my daughters, letting them be part of the creative magic and the real life workings of a small family business. I had a great time making up these fun packages of goodies for you! One lucky reader will get a colorful selection of Morris & Essex goods including one super-soft, hand-printed bamboo jersey scarf and six different letterpress greeting cards, and a little organic cotton zipper pouch, all packed neatly in a big, sturdy hand-printed cotton canvas tote bag. Wow!! Two other lucky readers will each get one hand-printed tea towel, two letterpress greeting cards, and one hand-printed zipper pouch. I also wanted to offer a special treat for everybody - 15% off everything in my shop for one week, using coupon /code SOULEMAMA at checkout, now through November 6. Oh my. This is quite generous. Thank you for the chance. Just gorgeous, I love everything! We enjoy using our blog to feature the travels and adventures our shoes have been on. Close to home, or around the world, we love them all. We invite you to share a photo on Instagram #aurorashoes. We're excited to share that after a lot of planning, we've finally started on a construction project that will basically double our capacity. We're looking forward to more production and warehouse space and can't wait to share photos once it's finished. For now we've closed our factory outlet, but are still in production and filling online orders. It's a big project, and we're excited to see where it takes us! We'll post pics on social media as we go, for anyone who'd like to check in and track our progress. In addition, Aurora Shoe Company would like to offer SouleMama readers free shipping on all domestic orders received through 12/1/16. To receive the offer, please enter "Soule Mama" at checkout. Yes please! The best shoes ever. Well! I had every intention of popping in here a few more times this week than I actually did. Where is the time going? How do we find ourselves at the end of October? How is the garden season over? How are my children so grown? How did all that gray hair appear overnight? There is no answer to those questions, except to say that the days are full, and full of goodness. It's damp and cold here today - wildly windy out there, and not suitable for anything more than hunkering down by the fire, and next to one another. But I did pop out to the garden to gather - in hopefully one trip - all that I'd need for the weekend ahead. A beef stew tonight, a cabbage slaw with lentils tomorrow, and some beets for preserving. Those beets! Can you believe them? Amazing. Bigger than any of the healthiest of the cabbage out there, some of them! And so very many more still to be brought in. Despite the chill and the wind, I don't think I could have been happier to fill this basket up and carry it inside earlier today in the rain. It is the very activity and project that I made the basket for - bringing in the garden haul. Everyone who sees my basket remarks (with love, I think?) on how she's got quite a cute little pregnant belly, this basket. It seems fitting. Not that I'm pregnant (really. I'm not. ), but the garden sure is, and life sure is. And somehow, with a little bit of stretching, there's always room to hold it all. And I'm always amazed at just how much one can stretch. Wishing you all a wonderful weekend ahead, however full it may be. It all shifted this weekend! I haven't heard rain on the roof in so long, but this weekend we did - and with thunder too. Such a relief to hear that sound, and comforting, really. As it came down, I settled into flannel sheets and down comforter with a book and a big exhale before sleeping better than I have in weeks. Though the wind and cold that followed took the last of the leaves off the trees and reminded us of just how real and soon the approaching season is. Our pace on splitting and stacking the last of the wood increased tenfold over the weekend, as the fire inside is now going all the time- our living concentrated to one incredibly full (and now messy) corner of our house. The negotiating (fighting) over who sits in the very spot closest to the fire has begun. We hosted a handful of the French exchange boys from Calvin's school for the weekend, with great hopes of getting them on the lake for some boating and fishing. They returned faster than I imagined, all shivering and edging their own way into that magical spot right in front of the wood stove. It's hard to keep in mind that soon it will be far colder and far less comfortable out there than it is now. But our bodies just haven't acclimated yet, particularly true for those not from here! And so, corners of our home are being refreshed and tidied, readied for the season ahead. A cozy new studio rearrange, more pillows for the daybed by the fire, a new bookshelf placed by Harper's bed because "I really, really want to have a whole lot of books that I can reach without getting out of bed". True that, my love. Tis the season for such things. Let's get ready. On Saturday, I had a long day of errands and shuttling children here, there and everywhere. The city felt remarkably quiet - the tourists mostly gone, and so many others staying in from the damp day, I presume. At the cell phone store, all the attendants jumped up from the couch they were sitting on watching football since no shoppers were requiring their assistance. At the feed store, I had to call out back to see if anyone was working and could help me buy the grain. At the restaurant that's often hard to get into without an hour wait or more, I was seated immediately for lunch. And at the food coop, I had a leisurely visit with the cashier about life - hers and mine, and butternut squash ideas too. And then, last on my list, I went to the yarn shop (Knitwit) to pop in for replacement needles (where are my size 4 circulars?). And there, well there it was an entirely different story! Bristol Ivy was leading a short row class full of happy attendees in the back of the shop, and the front was so full of the friendly faces of SO many shoppers. A line stayed steady at the checkout, and the warmth of all of those people - literal and figurative - took the chill of the day right off. I smiled, cheered a bit, as I waited my turn and paid for my needles (and maybe a few other things that somehow ended up in my hands). Yes, I thought. Yes, this is precisely where we are, in the season of cozy. Greetings from Annie Bryant Tales & Songs! Annie Bryant is a storyteller and songwriter who loves to transform the joy, laughter, growls and tears of family life into audio stories and songs for children. Inspired by nature's seasons, Annie writes and tells mostly original tales influenced by the ancient tradition of storytelling and fairytales, and woven together with her own enchanting voice and sing-along family folk songs. The Seasonal Collection includes 4 separate audio recordings, each one celebrating the deeper qualities of the four seasons and the rhythms of our natural world. Come Gather explores the quiet of Winter, Wake Up the joy and celebration of Spring, Jump In marks the long adventuresome days of Summer, and Seek & Find gives thanks for the Fall harvest. Perfect as bedtime stories, on long car trips or rainy afternoons, these Waldorf-inspired stories and songs honour and celebrate the magic, wonder and joy of a healthy childhood and the simple miracles of nature. Annie has performed her Tales & Songs far and wide throughout her homeland of Australia, at festivals, events, schools, libraries and markets, inviting children and families inside her magical Storytent and into the land of story. She currently lives on a little farm with her husband and two sons as well as a collection of furred, feathered and hoofed friends which continue to inspire her story and song journeys. The Seasonal Collection is available on CD or as a digital download and is best suited for ages 3 to 9 years old (although more often enjoyed by the whole family!). You can listen to Annie's stories and songs or read parent and teacher testimonials or say hi on Instagram or Facebook. Annie: Thanks Amanda it's so lovely to join the SouleMama community! One of the most unexpected and wonderful gifts motherhood brought me was the chance to see the world again through the eyes of a child. And seeing how much the simple wonders and magic of life nourished my own children inspired me to write stories and songs that might do the same for others. I tend to write about the 'little things' that as adults, we can often miss in our understandably busy lives, yet for children are absolutely packed with sensory awakening, awareness and delight. The warmth of a freshly laid egg on our skin, the whoosh of the air flying past us as the swing reaches high into the sky, or the gentle sound of the ocean bringing us a treasure. Each of the stories and songs on The Seasonal Collection celebrate - either gently or joyously - how we are all part of nature's rhythms and hopefully help little ones (as well as remind myself!) to welcome the true gifts of both the sunny and stormy moments in life. The Seasonal Collection 4 CD pack including more than 2 and a half hours of wondrous tales and sing-along songs for the whole family. In addition, Annie Bryant Tales & Songs is offering all SouleMama readers a 15% discount off The Seasonal Collection 4 CD pack by entering the coupon code SouleMama during checkout. Offer available until the end of October 2016. We've certainly had our share of stitches and staples, only one broken bone, but plenty of emergency room visits with this active crew of five children. But I don't think, in all these years, that we've had a black eye before this week and this little girl! If you ask her, she'll tell you that 'the swing did it.' It's true - in just the wrong position, leaf pile-jumping, she stood up just as a heavy wooden tree swing was coming her way, let go of by someone who had just hopped off it. An accident with shockingly few tears, but a very sad sight to behold! I finished the hat for my black-eyed girl last night. Annabel woke up very pleased to have been the recipient of my knitting, especially something in the colors of pink and purple and blue. The hat is Rambled, though the pattern doesn't show up terribly well with this handspun variegated yarn, but that's okay. Harper says she looks like she's wearing a 'silly chef's hat' which wasn't exactly what I was going for, but at least - because she's 'hurt' and deserving of extra kindness - he just whispered that to me. Annabel is happy with it. And though that black eye of hers doesn't hurt at all (she says), she'll happily take that extra kindness and love anyone wants to give her. And a new hat too. Last week, there was talk of a healthy family competition to see who could last the longest before voting to start the first fire in the wood stove. But then, the chimney sweep came (a favorite day around here), and there was a chilly night, plus we had company in the house, and the next thing I knew...upon returning home from my weekend away, I was met at the door with cheers of "fire!!!" by some excited little ones, running around barefoot once again (it wasn't that warm - it never is!). And then, I sat down right in front of that blessed fire to catch up on their weekend and to knit a spell (and try not to fall asleep - the biggest daytime challenge of that warm wood stove!). And so suddenly, here we are! Straddling both seasons. With some days cool enough to warrant lighting up that fire and welcoming all the fun and games that come along with it - yarn and blocks and oh, the board games (I do not know how I'll make it to spring with the sudden Monopoly love that came out of the blue!)! And then other days - like today, I do believe - we find ourselves running out of doors from breakfast till dinner, soaking up what could possibly be one of the last like it. You just never know. But for now, it's an absolutely beautiful autumn, with so much color still on the trees. The daffodils are planted - all 200 of them. And the garlic awaits, along with a whole lot of tucking for the garden. Heck, there's still harvesting to be done! There is a canoe trip planned for this weekend and some fishing too. So much left to enjoy, and the knowledge and comfort, too, that the cozy season -and this particularly cozy spot - is right here when we are ready to come in. I had the great pleasure and very good fortune of attending a small gathering of some wonderful women writers on an island off the coast of Maine this weekend. I know, right? Skipping over the fact that I still don't really call myself a writer, can we just talk about the island off the coast of Maine part? Then add in some amazing, kind and generous women and well! Lucky lady, I am. The sea calls me often and always has, and though I love where I am and can't see that changing, I do so love the islands of Maine and am incredibly grateful they are close enough for frequent visiting. Love, love, love. Growing up with our house on the harbor, my bedroom window was open all year round (much to my father's dismay, who fed the wood stove all night long - now I get it, of course) so that I could hear the waves and the sounds of the sea. This weekend, those soothing seaside feelings were found for me in the joy of waking up early enough to watch the sun rise from the porch - all alone with just knitting and tea in my lap. And later, watching the nearly full moon rise with new friends as we walked the beach at low tide, peeking at all the bits that the waves brought in. Bliss. In between was a whole lot of work accomplished (writing!) and even - get this - a nap! Granted, it was a twenty minute nap, but it was a nap nonetheless, and I really cannot remember the last time such a thing happened. What is there more glamorous or luxurious as that for a busy Mama? And well, really the best use of my time in that special setting, I do declare. I'm coming home today feeling so grateful for the connections that are made when when women gather to share the stories of our lives, the restorative power of the sea, and the blessing of an unexpected nap. Friends, I wish you all a most gentle and lovely start to your week! At Scratch, we’re passionate about nurturing the creative spirit of our local community, and providing access to high quality tools and supplies for makers of all sorts! Scratch is a two part endeavor: we’re an art and craft supply shop, as well as home to the area’s only fine arts and traditional handcraft-focused makerspace. We offer classes and workshops for makers of all ages and skill levels. We’re always excited to watch someone spread their crafty wings and try something new! We’ve worked hard to curate an inventory that represents all of our varied interests and brings our favorite designers and supplies together in one place. Our makerspace is home to varied workspaces, a sewing bar (with 8 sewing machines plus a Viking quilt designer! ), weaving looms, a tool library, a Carvey (2.5D milling device), and acts as our primary classroom. We also host a monthly book club, writer’s workshop, and weekly Craft Night event. In our store we carry natural fiber yarns, beautiful project bags, embroidery and needle felting supplies, fabrics, art paper, watercolor and acrylic paints, markers, colored pencils, coloring books, art supplies for kids, and craft kits of all sorts. You can sign up for Scratch’s email list here. Follow us on Facebook. Our Instagram is really fun! Scratch: Last winter, we (Scratch owners Jessica, Travis, and Karen) were pining over the idea of being full-time crafters and makers, when we decided, why not? We’re adventurous makers, and we know that others are, too… knitters like to paint, spinners like to crochet, needle felters like to sew, and everyone loves to color! We decided to create a space where all of our creative passions could come together, and the idea for Scratch was born. We spent the early part of 2016 contacting all of the people that we hoped to work with to bring our favorite things to our new shop, and made the move to New Hampshire over the summer. After a few busy months of painting, combing flea markets and salvage yards for furnishings, building displays, and seeking out local artists to fill our walls with beautiful things, we opened our doors September 1st. The community response has been hugely enthusiastic, and we’re excited to become a part of the SouleMama community as well! A $50 gift card to Scratch! Get a jump on your holiday shopping and/or crafting, or better yet, treat yourself! Would love a chance to win.! Thanks! Everyone, everywhere we go, is talking about the color this year. The foliage is more vibrant and beautiful than any recent year I can remember. It makes every mundane walk outside to do one chore or another a full-color experience. And all the drives - to school and back and and everywhere else we go - full of so much beauty it's impossible to look away from. I find myself standing under our giant old maple tree often, looking up as though I could absorb all that color and take it in for the colder, darker days ahead. In a way, that's exactly what's happening. Alena Hennessy began making art at a very young age. She would spend hours drawing on the back of her Grandmother’s dittos from school, making up imaginary worlds of falling umbrellas, rainbow puddles, ant farms underground, horses with varying personalities, and some very fashionable ladies. Since then her love of creating has evolved– branching out with a deep desire to assist others in finding their true voice in painting and mixed media art. Take an art spirit class from Alena here no matter where you live (wonderful for the whole family). Alena: The big news over here is that we are filming all new videos and lessons for my most popular ecourse A Year of Painting. I have renovated a new studio/workshop space on my land, so we will be recording all the lessons out here. I am so grateful that everyday my art and creativity for the spirit continues to touch people and that I can do what I love. This work provides such a wonderful and gratifying feeling, to see women all over the world tapping more into their creativity within themselves and expressing it in such an authentic way. An online course of your liking plus another surprise gift! From A Year of Healing to Kindred Creatures, there is a perfect virtual discovery out there for you. In addition, Alena Hennessy: Art Becomes You is offering all SouleMama readers 25% off through November 1st with the code soule25. I love Alena's art and she is such a healing inspiration. I am a beginner in painting and would love to take part in an online class of Alena. Soulemama is a great inspiration. Thank you. Earlier this week, after dropping Calvin off at school in the morning, I walked back into the house and waded through the boxes and trays of garden goodness to make my way through the kitchen - tomatoes, red and green, mostly. And I realized, as though this were a surprise to me, that they weren't going to wait for me to have a 'free day,' nor was it small enough of a task for a late night canning session. It was serious attention and time that was needed and the only time to do such a thing is the in the present. Use it or lose it. (Or something like that.) And so, abandoning the original plan for the day, I dove in. Of course, it's never as simple as just getting started. A quick search for a few key spices reminded me that it's been more than a few grocery trip 'in a hurry' where no one has slowed down in the putting away of groceries enough to really actually put them away. There were bags stacked on top of the jars that had now shifted in their labels slightly, and no one can operate effectively and efficiently in a pantry like that! And thus, I had the perfect job for the little boy who loves to help and was disappointed to hear we weren't getting to his writing lesson right away. With the handy Taproot jar labels (on the website as a free download), Harper spent at least the first hour at my side, cutting, labeling and writing (writing lesson!). When the lure of sunshine and his bike called him outside (understandably, it was a gorgeous day), I finished the job, sighed in the satisfaction of a tidy shelf, and promptly got to work in making a proper and full-on mess of my kitchen. And oh, did I make a mess! Many, many jars of green tomato salsa - I used a basic Tomatillo Salsa Recipe from the Ball Canning Book, and just subbed green tomatoes for tomatillos, roasting them first just a bit to hopefully add some flavor (it worked!). And then the Green Tomato Chutney, from Food in Jars. And with the last of the red tomatoes, jars upon jars more of simple Passata was made (like this, but I broiled quickly first) to add to the shelves. I stopped a few times at the request of this one, who wished that I watch her carefully remove her shoes (tap shoes, two different sizes, no ties) and place them by the door "just so" as she went outside "I'm leaving them here just like this because that's how someone that is royalty does it." So there you have it. I was a witness. At least ten times. There was also a mass exodus led by Adelaide to the barn to find the "back up dress up clothes." Does everyone have a Back Up Dress Up Bin in the barn? It seems excessive, I know. But then there's the hunt and subsequent discovery of some fabulously 80's unitards (thanks for all those dance lessons, Mom and Dad!) and suddenly "the perfect' Halloween costume is created! That inspired the whole crew, of course, to find their own. And so right now, we have a joker, a police officer, and a night queen (she was a night princess last year. She's grown, you know). No doubt it will be an entirely different assortment of personalities today. Thank goodness for that back up dress up bin. I was read to, as well. By all three of these littles, as I stood in that one same exact spot in the kitchen all day long - moving tomatoes from here to there, jars from there to here, and washing more rounds of dishes than I can count. (And missing my favorite dishwasher sidekick Ezra, who is the best dishwashing DJ ever, but was feeling under the weather and napping most of the day.) There were at least two bandaids applied, if I remember correctly. And one round of "sheep's out!" that had us all pouring out of doors and enticing a sheep back to the proper side of the fence. Surely there were a few arguments that I broke up, though I blessedly don't really remember those. At a certain point, just when I started to feel that slight "oh, I've been standing in the same position all day!" alert in my lower back, I remembered that we needed dinner. With tomatoes in front of me as the obvious choice and imagination running low, I went for some Green Tomato Curry that had been recommended (thank you, Jennifer!). It was absolutely delicious and immediately added to my 'to can' list. And on and on like that it went, as Papa and Calvin came home from work and school, as I sort of sat for dinner, as all those jars waited their turn for the canner and the timer was set over and over again for another round. More dishes were washed, more company was had in the kitchen, and finally, with the very last round removed from the canner quite close to midnight, I left the kitchen. A short sleep later and we were up, getting Calvin out the door for school and ready for another to day to begin. "Look," I said, pointing to all the jars lined up in the pretty early morning sunlight. "Endless salsa!" "Cool," he replied, not actually interested or even awake but humoring his mother nonetheless "Is that what you did yesterday?" Yes. That's what I did yesterday. It all depends on the hour of the evening or which one of us you ask, but the story of how we met most definitely changes ever so slightly with each telling. The cold hard facts are that it was second grade, we were both in the same class, and our teacher was turning thirty (so old!). I, being me, had carefully organized for a class gift to happen, collecting a dollar from everyone in the class and preparing the gift (that of course, only I had chosen) ahead of time. She, being her, had opted out of the plan that everyone else was going along with and created her own unique gift. Thereby, of course, ruining EVERYTHING! Most especially my plan. And here's where a whole lot of discrepancy comes in. There may have been a curse word uttered from one of us to the other, or there may have simply been accusations of one, there was a visit to the principals office, maybe detention, maybe not, but definitely tears. Oh the intensity of being eight years old! It was that, for sure, an intense day in the life of two eight-year-olds. That day was also the start of my oldest and dearest friendship. One that has gone on now for, oh gosh, well, a very long time. Quite easy to count too, as we both turn forty this fall. Thirty-two years we've spent together - wading through awkward teen years, stumbling through tumultuous college times, somehow landing in motherhood alongside one another and of course all the life that happens in and around all those years. We have gotten each other both into and out of trouble countless times. We share holidays together, and our families with one another, and despite how different our day to day lives are, our friendship, rooted so deeply in the past, only continues to grow in love and strength as the years go by. I never take for granted how blessed I am by this kind of friendship in my life. Thank you, dear Rachael, for all these years of love and laughter and friendship. Thanks for putting up with me. Thank you for being you. But most importantly, thanks for making all my future gift-giving holidays with you SO much easier. Yarn for everyone! Hooray! I've been so lucky with the lack of frost in our particular corner of the world (neighbors not so far away have already had one). But I really was taking my chances there and cutting it close. Yesterday, we brought all of the tomatoes in (green or not), some of the beans (more to come today), all the peppers and cucumbers, and I began to gather the pumpkins and squash. I forgot about the basil, but I'll grab that today. Though the forecast actually looks lovely and we might just be spared a few more days, I have no desire to run out by headlamp after a long day gathering everything that needs gathering to save it from a frost (says the lady who does that very thing nearly every single year). And now it's on my kitchen table. And there is nowhere to sit and actually eat a meal. So it seems that preserving is on the top of my to do list today (and tomorrow, and the next day). First up, all those tomatoes! I already plan on Green Tomato Chutney and Green Tomato Salsa Verde and I'll have to poke around for more (recommendations?). I best get to it! This weekend, I very much wished there were some magical Mama machine that would allow me to be in three places at once. Increasingly that's the case, I'm finding, and I can only imagine the day coming soon that it will be five places at once that I'm hoping to be as each of these kiddos has their own exciting adventures, performances, races, and games that I want to attend. Does this sound family, Mamas? The pace of activity increases each year as they age and grow, and it's all good and wonderful things, of course. We try to delicately balance that tight rope of "Yes! You should absolutely do this, that, or the other thing that you are passionate about and we will support you 100%!" to sometimes having to make the call of "I'm sorry, but this time, right now, that just doesn't work for our family." The living, breathing, entity that is our Family, made up of all these seven individual parts. The Family has needs too. Surely, I've rambled on about this before here, and surely I will again, for it is precisely where we are right now in life and looks to be where we'll stay for at least another decade, and I'm far from having it all figured out. But I am learning a few things as we get deeper into this world of only more fullness in our days. Or rather, I've been reminded of some lessons that were essential in the intense days of birthing and the early parenting a newborn child and am calling upon those once again, for they are just as relevant now. Things that are so simple and should just be second nature to do, but sometimes, for all of us, slip away in the flurry of the days and the fullness of family life. Most importantly, Self-Care....and Asking for (and Accepting) Help. So obvious, right? And yet we all, from time to time I know, let these things slide just a little bit. For me, those lessons have manifested in different ways recently and continue to shift as I keep them front and center in my focus. For one, I cannot remember the last time I had a late night crafting session! Neither can I remember the last time this former night owl made it past 10pm, as more often, I am asleep before at least several of my children. It's as though I am getting in shape for a marathon (not that I have ever done such a thing to have experience on the subject, but I can imagine), taking such care with food and sleep and mindfully not wasting energy on things that don't matter, and in a way, sometimes the days feel just like that. A really wonderful marathon, but a marathon nonetheless. And help. Oh, it's tricky to ask for that isn't it? And even harder, sometimes, to accept it. But we are not meant to do it all - just one person or even one well-working team of parents. Perhaps it is the close self-examination that 40 has brought or perhaps it was simply necessity, but increasingly of late I find myself relying on others to make our days flow (and hopefully returning the love and energy in kind!) - whether it be with work, or the house, the farm, or the kiddos - and oh, the driving. We live in nothing like a literal village, but indeed there is a figurative village of a kind, of people whom we love and whom love us, and our family is made stronger by their presence, and their helping hands. This morning, while Papa is working away from home, I will be in my studio focusing on the next issue of Taproot, and the beginnings of our holiday pop-up shop while my four littles are whisked off to the library with a friend. Upon their return, we'll meet in the garden where I hope to harvest so many of the things before dance classes and haircuts tonight. Because it's true what they say, many hands make light work. In so many ways. Wishing you some lightness in your week ahead, in whatever way you need it most of all! Greetings from Winterwoods Tea Company! At Winterwoods Tea Company we're passionate about creating delicious, nourishing loose leaf tea blends using the finest locally farmed and wild foraged organic herbs. We begin by sourcing our ingredients from small, sustainable farms and companies who support our values and we hand-mix all of our original tea blends in the heart of the Pacific Northwest in beautiful Spokane, Washington. Our tea is carried at natural foods stores, gift boutiques and coffee/tea shops across the United States and we also sell through local farmers markets as well as online. We believe that tea should be healing and nourishing and that's why you'll never find synthetic ingredients, preservatives, artificial flavors or artificial colors, refined sugars, sweeteners or other additives in our teas. As a “farm to tea cup” company, our original blends contain only organic herbs, spices, tea leaves, dried fruit bits and sometimes pure extracts. All of our blends are gluten and dairy-free. Follow Winterwoods Tea Company on Instagram. Tirza: Since our last SouleMama feature, our wholesale operations have exploded. We’ve partnered with natural foods distributor Azure Standard and etsy Wholesale has been an important avenue for getting our products into independent gifts shops all over the country. As our wholesale operations have grown, our participation at local farmers markets and events have slowed down but we still enjoy connecting directly with our customers. Last fall we were also selected as a “Top Pick” in an international Kickstarter campaign that allowed us to raise $35,000 which we used to build our own commercial tea kitchen in Spokane, Washington. We're in the middle of our second Kickstarter campaign to launch our brand new line of Pacific Northwest blends. These four new blends include northwest grown, organic ingredients such as wild cedar tips, juniper berries and cranberries, and are exclusively available on Kickstarter until October 15. Two of our brand new herbals blends (part of the Pacific Northwest line): Wildwood Cedar and Mount Hood Hops along with a tea infuser. Wildwood Cedar: Wildwood Cedar is a delicious woodsy blend with deep, robust flavor. The combination of wild cedar tips, peppermint and cinnamon bark work together to create a very unique and flavorful herbal blend. Ingredients: Organic cinnamon bark, organic papaya leaf, organic peppermint, organic raspberry leaf, organic wild cherry bark, wild cedar tips, organic licorice root, organic chicory, organic cloves, organic sarsaparilla, organic fennel, pure extracts. Mount Hood Hops: A wonderful sleepy time or evening tea, Mount Hood Hops makes use of the Mount Hood variety of hops and pairs it with chamomile, dried pears and vanilla. Medicinally used as a sleep aid, hops make a wonderful herbal tea and this blend is mild and sweet. Ingredients: Organic lemon balm, organic skullcap, organic passion flower, organic hops, organic valerian root, organic chamomile, pure extract, dried pears. We’d also love to offer SouleMama readers 10% off any purchase until the end of October. Please use coupon code: soulemama. Greetings from Salty Dog Farm! 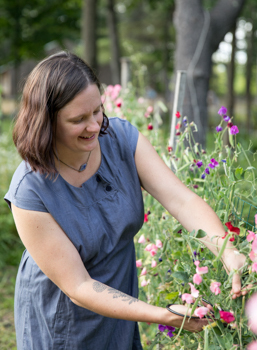 Sam Cheeney and Sasha Alsop own Salty Dog Farm where they have been growing organic seed garlic for the last decade on their small organic family farm in coastal Downeast Maine. They sell nine varieties of organic garlic ranging from hot to mild. Varieties like Chesnook and Music are great for baking while other varieties, like German Extra Hardy and Russian Red, run hot and spicy. For those garlic lovers that enjoy their garlic mild, Philips and Kerney are a great fit. All the garlic varieties that they sell are certified organic through the Maine Organic Growers Association (MOFGA). You can sign up for our email list by clicking on this link. In November 2009, Sam Cheeney and Sasha Alsop bought a 90-acre organic farm on a salt marsh in Milbridge, Maine. Sam's family homesteaded in New Hampshire and he grew up surrounded by fresh food. Sasha worked on a couple of farms and loved being outside in the gardens. Together they decided to start Salty Dog Farm. They primarily grow organic seed garlic. They both fell in love with growing organic garlic because they love the taste of it and the ease of growing it. They sold their garlic at the Common Ground Country Fair in Unity, Maine for a few years and realized that they might be able to sell for a longer season if they sold online. The website gave them the perfect opportunity to showcase their favorite garlic varieties. They currently sell nationally and even had their first international order (in Iceland)! A pound of our organic seed garlic! Winners can choose either one pound of one variety or a half pound of two varieties. Please check out our website to choose which variety (or varieties) you would like. I have been thinking it's time to order seed garlic... so this would be perfect! I'm so pleased to welcome the following Sponsors for October! Anne Riggs Designs presents beautifully handmade reusable products for your home and family, from paper towels, cloth napkins and bowl covers to baby wipes to makeup pads. A wonderful gift for anyone who values a sustainable lifestyle, Anne’s products are designed to lessen the burden of throw-aways on the environment. These essential, everyday-use items are an initial investment with long-term savings. Morris & Essex produces colorful and original hand-printed paper and textile goods, including beautiful, super-soft bamboo jersey scarves, cotton tea towels, organic cotton tote bags, t-shirts, letterpress greeting cards and more, all hand-printed in a farmhouse studio in Limington, Maine. Our high-quality products are all designed by artist Eliza Jane Curtis, with a passion for color, pattern and function. Each one features colorful handmade patterns, textures and motifs inspired by a love of the natural world, geometric patterns, and vintage designs. Everything is hand-printed here in Maine. We use natural and sustainable materials and processes, and focus on supporting talented local artisans and positive, sustainable, business practices. At Sarah’s Silks we believe in the power of imaginative play! We make simple, beautiful toys to inspire children to pretend as the true ‘work” of childhood is to play! Our playsilks and dressups are well loved by families all over the world. Over the past 22 years we have been amazed at the creativity of children who use our toys to dressup, build forts, make puppet shows, be super heroes, dance, play peek-a-boo and much more! We hope you will find joy and magic in our silks as well. Use coupon code: soulemama for 20% off your order.